It’s been good for fans of satirical punditry and honesty in journalism that Jon Stewart’s retirement from The Daily Show hasn’t meant his total absence from TV. Just last week, Stewart showed up on the final episode of The Nightly Show to eulogize Larry Wilmore’s work. And before that, he lent his slightly rusty ranting muscles to Stephen Colbert’s Late Show during his coverage of the big political cons. But there’s another Jon Stewart on TV, too, one that’s revealed himself slowly since he was freed from his suit-and-tie shackles last year. He first appeared shortly before Stewart’s retirement, at an edition of WWE’s Monday Night Raw, before hosting SummerSlam 2015. 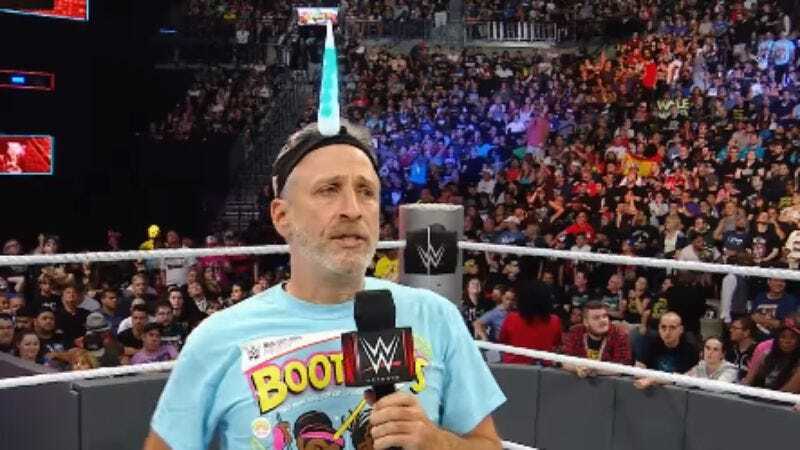 And now, Wrestling Fan Jon Stewart has emerged to show off his unicorn horn once again.